Art became a passion after retirement from 26 years as a Lcol in the U. S. Marine Corps. An MS in Engineering also transmitted itself into some of his artwork. Self-study of art, color and techniques was the beginning of a wonderful new adventure, leading to workshops with International Master Artist, Tom Lynch. Thus, light, color, and impressionism in watercolor are an integral part of Everett’s artwork, and the study with Mr. Lynch continues through numerous workshops and travels across the United States. Everett realized his love of teaching after being an instructor at his Alma Mater, the United States Naval Academy, and continues to teach courses and workshops in a classroom setting, as well as Plein Air (painting outdoors) in local areas. Everett’s Watercolors art supply business evolved from making the fine art supplies he uses available to the students. Everett is a member of the Southside Artists Association, and the Virginia Watercolor Society, winning ribbons and awards at various art shows in Virginia and Texas. He served as a Charter Board Member of the Chesapeake Friends of the Arts, Chairman of club member art shows, and invited to jury other art functions. 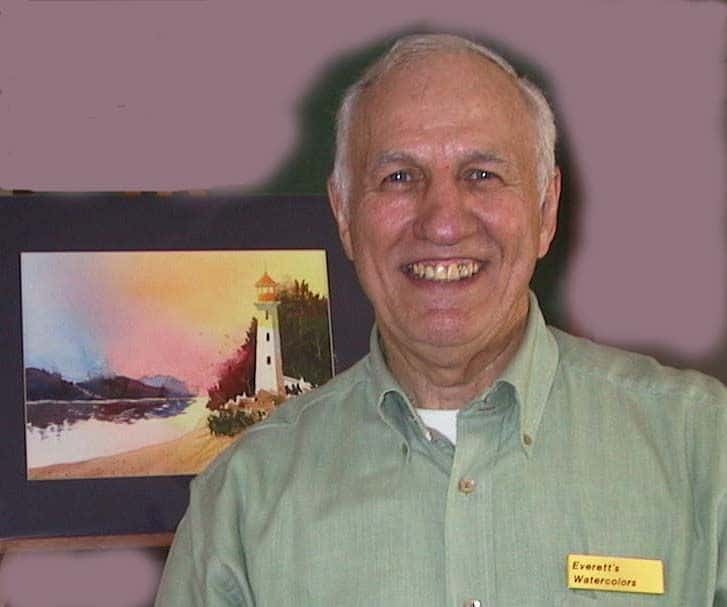 As a Resident Artist, Everett's works include a series of paintings on the Great Bridge area of the Intercoastal Waterway, including recreation of historical scenes, and nearby Great Bridge Lock Park, as well as Northwest River Park. Chesapeake Parks and Recreation, and individual commissioned paintings. A wall mural of the "Buddy" Bagley Stage is displayed at the Bank of Hampton Roads in Great Bridge as Public Art. Copyright 2016 Everett's Watercolors. All rights reserved.